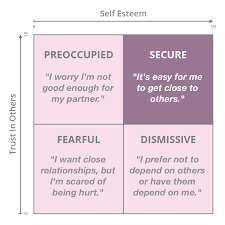 People vary considerably in how secure or insecure they feel in their relationships with others. Research on adult attachment is guided by the assumption that the same motivational system that gives rise to the close emotional bond between parents and their children is responsible for the bond that develops between adults in emotionally intimate relationships. People who formed secure attachments in childhood have secure attachment patterns in adulthood. They have a strong sense of themselves and they desire close associations with others. They basically have a positive view of themselves, their partners and their relationships. Their lives are balanced: they are both secure in their independence and in their close relationships. Those who had avoidant attachments in childhood most likely have dismissive attachment patterns as adults. These people tend to be loners; they regard relationships and emotions as being relatively unimportant. They are cerebral and suppress their feelings. Their typical response to conflict and stressful situations is to avoid them by distancing themselves. These people’s lives are not balanced: they are inward and isolated, and emotionally removed from themselves and others. Children who have an ambivalent/anxious attachment often grow up to have preoccupied attachment patterns. As adults, they are self-critical and insecure. They seek approval and reassurance from others, yet this never relieves their self-doubt. In their relationships, deep-seated feelings that they are going to be rejected make them worried and not trusting. This drives them to act clingy and overly dependent with their partner. These people’s lives are not balanced: their insecurity leaves them turned against themselves and emotionally desperate in their relationships. 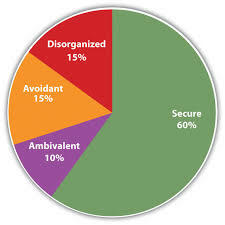 People who grew up with disorganised attachments often develop fearful-avoidant patterns of attachment. Since, as children, they detached from their feelings during times of trauma, as adults, they continue to be somewhat detached from themselves. They desire relationships and are comfortable in them until they develop emotionally close. At this point, the feelings that were repressed in childhood begin to resurface and, with no awareness of them being from the past, they are experienced in the present. The person is no longer in life today but rather, is suddenly re-living an old trauma. These people’s lives are not balanced: they do not have a coherent sense of themselves nor do they have a clear connection with others. I like this attachment overview by Chris Fraley. He includes a questionnaire which looks at our attachment patterns with various people in our lives – mother, father, romantic partner, friend; really worth completing.